Gottfried Haberler (July 20, 1900 - May 6, 1995) was an economist of the Austrian School, who moved to the United States to hold positions at Harvard University and later as consultant and scholar in Washington D.C. He worked in particular on the theory of business cycles and international trade. In a career that spanned seven decades, his work involved original contributions to many aspects of economic theory. In particular, his work on international trade, advocating free trade as an effective policy for developing nations, was a ground breaking insight well ahead of its time. As globalization has advanced, breaking down the barriers between nations on all levels, developing and developed nations alike stand to benefit from the free exchange of material, intellectual, and spiritual goods. Gottfried Haberler was born on July 20, 1900, in Purkersdorf, near Vienna, Austria. He studied at the University of Vienna with three of the leading figures of the Austrian school of economics in the years immediately after the First World War: Friedrich von Wieser, Ludwig von Mises, and Hans Mayer. At the university his closest friends were three other students who, like himself, were to become internationally renowned economists in the decades to come: F.A. Hayek, Oskar Morgenstern, and Fritz Machlup. After Haberler earned his degrees in political science (1923) and law (1925), Mises helped arrange for him to receive a Spelman Fund (later Rockefeller Foundation) grant that enabled him to have two years of further study in the United States and Great Britain. After returning to Austria, Haberler became a privatdozent (an unsalaried lecturer) at the University of Vienna, teaching a joint seminar with Hayek and Morgenstern. Mises arranged a paid position for him in the library at the Austrian Chamber of Commerce, where Mises was employed as a senior economic analyst. Haberler was a visiting professor of economics and statistics at Harvard University in 1931-1932. In 1934, he accepted the two-year appointment with the League of Nations in Geneva, Switzerland, that led to the publication of Prosperity and Depression. In the autumn of 1936, Haberler began a professorship in economics at Harvard University that lasted until his retirement in 1971. He also served as an economic consultant with the Board of Governors of the Federal Reserve System from 1943 to 1947. In 1971, Haberler left Harvard to become a resident scholar at the American Enterprise Institute in Washington D.C., together with his old schoolmate Fritz Machlup. His neo-liberal policy prescriptions became the hallmark of that institution. Until shortly before his death on May 6, 1995, at the age of 94, he remained a senior scholar at the American Enterprise Institute. Austrian school economists frequently speak of the early and late writings of Haberler. His first book was, The Meaning of Index Numbers (1927), an Austrian work showing that statistical aggregates hide the essential relative price relationships in a market. He offered an alternative, which he saw as more consistent with an Austrian understanding of the way prices move. In 1931, Haberler published The Theory of International Trade, in which he reformulated the traditional "theory of comparative advantage" in an Austrian School view of opportunity cost. He also refuted protectionism and demonstrated that international trade assures economic efficiency and high living standards. Later, he updated his critique of trade barriers with Liberal and Centrally Planned Trade Policies (1934). One of Haberler's greatest papers, "Money and the Business Cycle," was presented in 1932, at the University of Chicago. It is an excellent exposition of the Austrian theory of the trade cycle, in which he showed why the Federal Reserve's attempt to "stabilize" the price level created the conditions that led to the Great Depression. This valuable contribution is reprinted in the Mises Institute's Austrian Theory of the Trade Cycle and Other Essays. In an early revised edition of his Prosperity and Depression (1937), Haberler criticized Keynes' theory of the "liquidity trap." Haberler developed an argument that later became famous under the name the "Pigou Effect" (after his collaborator Arthur Cecil Pigou), which showed that prices are more flexible than Keynes had assumed. This book was a great success, and even after Haberler had moved closer to a Keynesian position, he always remained a strong advocate of free markets and free trade. Haberler argued that, in fact, there is no way to strictly measure and determine the general value of money through the use of index numbers of various types. The only precise definition of the value of money is that it is represented by the network of individual exchange ratios between money and all of the individual goods against which it trades. Every general index of prices is necessarily constructed by selecting some prices (various consumer or producer prices) as representative of the subgroup of goods under study. They are weighted according to their proportion of purchases, summed together, and mathematically averaged to create a statistical composite that is then tracked through time (Haberler 1927). Furthermore, Haberler argued, precisely because a price-level index is an average of the set of individual market prices from which it is constructed, it may hide all the significant individual relative price changes beneath its statistical surface. The relative position and change of different groups of prices are not revealed, but are hidden and submerged in a general index. Not the movement of the general price level, but the chronological succession of special price and price combinations … are regarded as significant for the waves of business life…. Such a general index rather conceals and submerges than reveals and explains those price movements that characterize and signify the movement of the [business] cycle (Haberler 1928). Haberler explained that in the process of increasing the money supply sufficiently to prevent prices in general from declining, owing to lower costs and greater output, a monetary expansion through the banking system pushes interest rates below the market level that would have been established by actual savings and investment demand in the economy. In the 1920s, this policy induced long-term investment projects in excess of real savings in the market, resulting in an imbalance that finally manifested itself in the economic downturn and depression that began in 1929, and intensified in the early 1930s. Haberler reached a conclusion that once begun, the economic downturn of the early 1930s had increased to such an intensity that a "secondary depression" had set in, having little to do with any healthy correction from the mal-investments created by the Federal Reserve's monetary policy of the 1920s. Rigid costs resistant to downward adjustment, bank panics, and failures that caused an actual contraction in the supply of money and credit, and pessimistic expectations on the part of the investment community generated a situation in which only a government-initiated stimulus of spending and "effective demand" could bring about a reversal of the depressionary forces (Haberler 1941). Haberler argued, in the 1939 revised edition of Prosperity and Depression, as part of his critical evaluation of Keynes's The General Theory of Employment, Interest and Money, that Keynes had failed to appreciate what has become known as the "real cash balance effect." Even if people were reluctant to spend in the depression because of pessimism and a desire to hold their wealth in a more liquid form, as prices and wages decreased, the real value and purchasing power of their money assets would be increasing, since each unit of money at lower prices could now buy more. A point would be reached at which people would find it advantageous to start spending again, at which time prices and wages would no longer have to fall, and all those desiring employment would find employers willing to hire them to satisfy this renewed demand for goods and services. He claimed that any prolonged price inflation had its origin in expansionary monetary policy. Government inflationary policies could temporarily reduce the unemployment generated by union wage demands only by creating enough money in the economy so that employers could afford to pay higher money wages. But this was only a short-run solution, since unions would then demand even higher money wages for their members to compensate for the lost purchasing power resulting from the higher prices caused by the monetary expansion (Haberler 1951). Haberler helped revolutionize the foundations of international trade theory by restating the theory of the international division of labor on the basis of the Austrian theory of opportunity cost. The relevant cost was not the labor time to produce something, but the alternative end that has to be forgone. 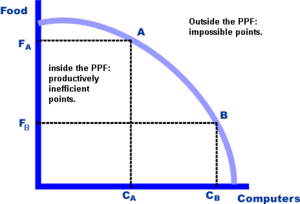 Haberler demonstrated the logic of this principle by being the first to construct that simple diagram that is now found in every economic principles textbook: The production possibilities frontier, which depicts the trade-offs that an economy faces between producing one of two products, such as food and computers. The members of that economy can produce either one of the goods or some combination of the two. The curve shows the additional amount of one good that can be obtained by forgoing a particular quantity of the other. Haberler explained that even when one of the two countries is absolutely more efficient in producing both goods, each country should still specialize in manufacturing and trading those commodities in which it has relatively greater efficiency. Thus, in this example, one country should focus on computer production and the other on food. In developing and consistently applying this reformulated theory of the benefits of international specialization, he was able to prove the continuing superiority for a policy of free trade over protectionism or autarkic self-sufficiency (Haberler 1930). Finally, Haberler insisted that the underdeveloped countries of the "Third World" were moving in the wrong direction by turning to planning, controls, and protectionism in the name of economic development and growth. He reasoned forcefully that international trade would not create either permanent under-industrialized dependency on Western industrial nations or worsening terms of trade. Nor would government-induced domestic production either create real industrial efficiency or raise the standard of living of the people in those countries, in comparison to participation in the international division of labor. The best policy for all nations remains the free exchange of goods and capital. Haberler's model showed that this leads to economic improvement and rising living standards for the greatest number of participants in the global marketplace (Haberler 1959). Haberler spent years researching and consulting on the various competing theories of the causes and consequences of business cycles and formulated a "synthetic" alternative, the result of which was published in early 1937, under the title, Prosperity and Depression: A Theoretical Analysis of Cyclical Movements. For over 60 years it has been considered the classic summary and critical evaluation of the literature on this subject. Indeed, Joseph Schumpeter referred to it as a "masterly presentation of the modern material" for which he had the greatest "admiration." And one of America's leading Keynesian economists, Paul A. Samuelson, hailed it as "the definitive study of business cycles, both pre and post-Keynesian." Austrian economist F. A. Hayek also drew attention to Haberler's "excellent exposition" criticizing some of the fundamental assumptions and concepts of Keynesian economics. But this work was only one of Gottfried Haberler's many important contributions to economic theory and policy. In a career that spanned seven decades in the twentieth century, he made original contributions to monetary theory and policy, the theory of wages and union power, international trade, and the theory of economic development and growth. In particular, his advocating free trade as an effective policy for developing nations was a ground breaking insight well ahead of its time. Haberler, G. 1925. "Critical Notes on Schumpeter's Theory of Money: The Doctrine of the 'Objective' Exchange Value of Money" in Selected Essays by Gottfried Haberler. Cambridge, Mass. : MIT Press, pp. 531-52. Haberler, G. 1928. "A New Index Number and Its Meaning" in The Liberal Economic Order. Vol. II, 113-15. Haberler, G. 1930. "The Theory of Comparative Costs and Its Use in the Defense of Free Trade" in Selected Essays. pp. 3-19. Haberler, G. 1941. "Prosperity and Depression." pp. 323-44. Haberler, G. 1951. "Wage Policy, Employment and Economic Stability" in The Impact of the Union. Harcourt Brace, New York. pp.34-62. Haberler, G. 1952. "The Pigou Effect Once More" in Selected Essays. pp. 573-80. Haberler, G. 1959. "International Trade and Economic Development," 1961. "Terms of Trade and Economic Development," and 1964. "Integration and Growth of the World Economy in Historical Perspective" in Selected Essays. pp.453-527. Biography of Gottfried Haberler (1901-1995) - Ludwig von Mises Institute. This page was last modified on 27 June 2017, at 16:17.